This weeping Crybaby wah gets the nod from a Seattle grunge legend. Jerry Cantrell recalls his signature wah pedal at Dunlop: "It looks great, sounds great, and it's mine, man". 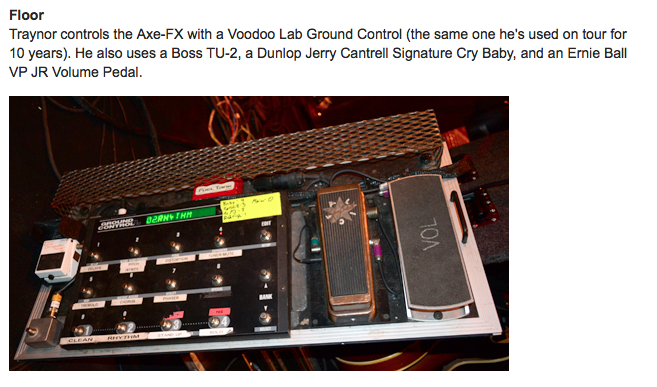 [This article](http://www.premierguitar.com/articles/Rig_Rundown_Bushs_Chris_Traynor) says that Traynor "also uses a Boss TU-2, a Dunlop Jerry Cantrell Signature Cry Baby…"
Gary presents his Dunlop JC95 as of 1:36. "It's my favorite wah. It's got a great sweep," says Monte, about his Dunlop JC95 pedal, at 5:53 in this rig rundown video. Damon uses Jerry Cantrell Signature Wah according to his artist page on Dunlop's [official site](http://www.jimdunlop.com/artist/damon-johnson). "Kotzen’s guitar tone is fat and natural sounding. All of the reverb and tremolo you hear comes from the Vibro-King. His bare-bones pedal board contains only a Sobot Drivebreaker 4 overdrive, a Tech 21 digital delay and a Dunlop Jerry Cantrell wah." "I’m using a Dunlop Jerry Cantrell Wah, a Dunlop Jimi Hendrix Octavio, and a Chandler Digital Delay." In this Rig Rundown Shaun Morgan talks about his equipment for upcoming Seether Tour. His pedalboard can be seen 4:46 into the video, with Dunlop Jerry Cantrell Wah on it. He clearly uses a Cry Baby Jerry Cantrell Signature in these serie of videos for EMG TV. Guthrie's Dunlop JC95 can be seen at 5:25 in this pedal rundown video. He says, "When you pile on the overdrive it's reassuringly meaty and thick sounding." In this video Lita mentions that she uses Jerry's Signature wah and it is the best wah wah pedal for her. 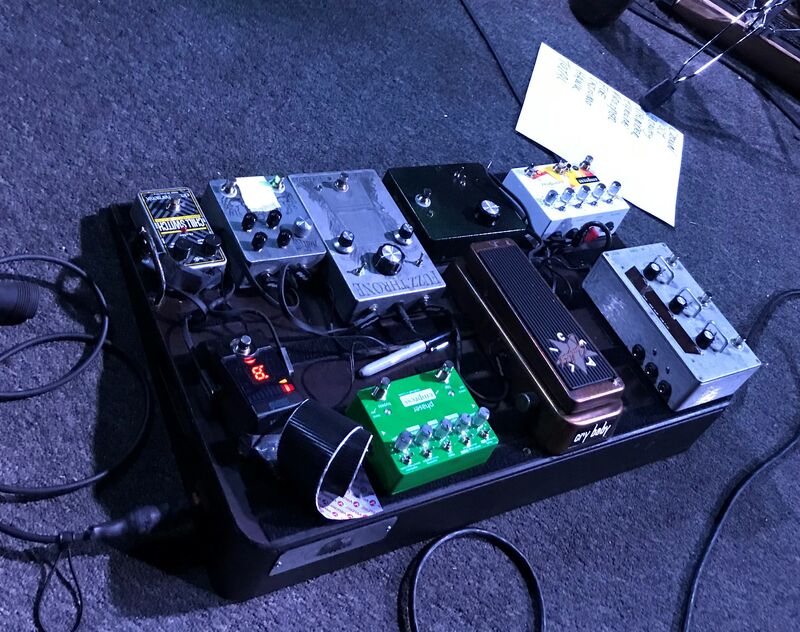 It's mentioned in [this](http://www.premierguitar.com/articles/22482-rig-rundown-halestorm) rig rundown that Joe Hottinger uses a Dunlop JC95 Jerry Cantrell wah pedal. The Dunlop JC95 Jerry Cantrell Signature Cry Baby Wah pedal offers the kind of wide dark response favored by Jerry. The Cantrell signature wah is custom-voiced for a tight, punchy heel-down guitar tone. One of the most influential guitarists to come out of the Seattle rock scene, Jerry Cantrell's epic riffs and searing tone have been the driving force behind Alice in Chains since the late '80s. His melancholy wah-drenched melodies in modern classics like "Man in the Box" and "The Rooster" left an indelible mark on a generation of guitarists. A rugged side-control knob lets you fine-tune the toe-down frequency. And with its antique, oxidized "road worn" brass casting and custom Alice in Chains tread, the Jerry Cantrell Signature Cry Baby is a wah pedal that looks as great as it sounds. Power the Dunlop Jerry Cantrell Signature Cry Baby Wah with a single 9V battery (accessed via the pedal bottom), a Dunlop EC8003 AC adapter, or a Dunlop DCB10 DC Brick power supply (not included). What can I say?... I'm a huge AIC fan. The Wah sound I've been searching for! Beautiful thick and creamy Wah sound. Have the sweep control knob set in the middle and it's perfect. Highly recommend this pedal if you like a darker sounding Wah. Dunlop has a pretty large palette of wahs, but there is something really special about this JC95. It's not harsh or shrill like others, it's less trebly and rather low-to-mid-focused pedal which gives you that authentic and true wah tone we all look for. I was positively suprised how it handles really hi-gain and at the same time how pleasant it sounds on cleans. Perfect wah, without any doubt! The JC95 Wah has been on my board for a little over three years now and I don't see it coming off any time soon. The sound is very mid-rangy, without the sharp earsplitting frequencies you get from most Wah's. If you've ever listened to Alice in Chains then you know about what you're getting. Dunlop did a fantastic job nailing Jerry Cantrell's tone. On a side note, it also nails Tool's Adam Jones' tone. The beat-up brass enclosure looks road-worn, but the pedal is actually built like a tank. The only thing I don't like about it is the price. If it wasn't endorsed by a major artist then it would probably be in the $119 range. Even so, I highly recommend! This wah pedal lives on the distortion side! Captures the Alice in Chains tone to a T. Currently own the Limited Edition version. Willing to sell for the right price. I am a bit of a wah whore...i have collected and sold too many over the years and this is the one that i stuck with. Its in my top 3 wahs along with the AMT Japanese Girl mini wah and the GIG FX Kilo wah. Te Cantrell has a great sweep range and a "tone" pot to just the sweep sound from dark to brighter. The only issue i have had is the tone pot came loose and was impossible to use but its an easy quick fix. Its chunky and creamy and smooth. Personally not a fan of Cry Baby's but this pedal is the exception and the limited edition red and black one looks sick.